A gift is the shape one’s feelings take. It is a statement of love, friendship, and gratitude. Finding that right gift for your dear one might be a bit of a challenge with all the products out there. Whether you’re looking for great Valentine’s gifts for him or for her, you might want to check the list below for a few ideas and products that will help you send your message memorably. Get inspired and find products that would make excellent Valentine’s Day gifts. Few products reach the beauty of musical boxes when it comes to romantic gifts. Such items have a charm of their own and if that’s what you have in mind for your beloved one, you might want to try the Heart Shaped Vintage Wood Carved Musical Box from Westonetek. Made of high-quality wood, the box can be opened so you can see how the mechanism inside it works. Since it is a traditional musical box, you will have to wind up the movement on the bottom to play music. What better way to say I Love You than this dance of sounds? Your gifts need the right box or wrapping in order to be complete. The gift boxes from Chilly will help you with that by providing you with 12 different boxes you can use for gifts to suit all occasions. The boxes come in various patterns and colors so you can choose the one your sweetheart would love. The boxes are 14.5*14.5*9 CM / 5.7*5.7*3.6 inches, which makes them suitable for cookies, cakes, handmade products, soaps, and all sorts of small items. The boxes can also be used as home décor boxes thanks to their beautiful designs. Want to celebrate this Valentine’s Day sweetly? If you’ve opted for a cake or cookies, the boxes from Domagron are just the ones you need to complete your gift. The set includes 12 treat boxes you can fill with gifts of sweetness. The boxes measure approximately 10.6 x 6.1 x 1.4 inches, so they are big enough to host the cakes you’ve made or a bundle of candies. They can be easily assembled. Their Valentine’s Day themes make them perfect for this year’s celebration of love or any occasion that involves a statement of fondness. Heart shaped or heart-themed products are the VIPs when it comes to a Valentine’s Day gift. 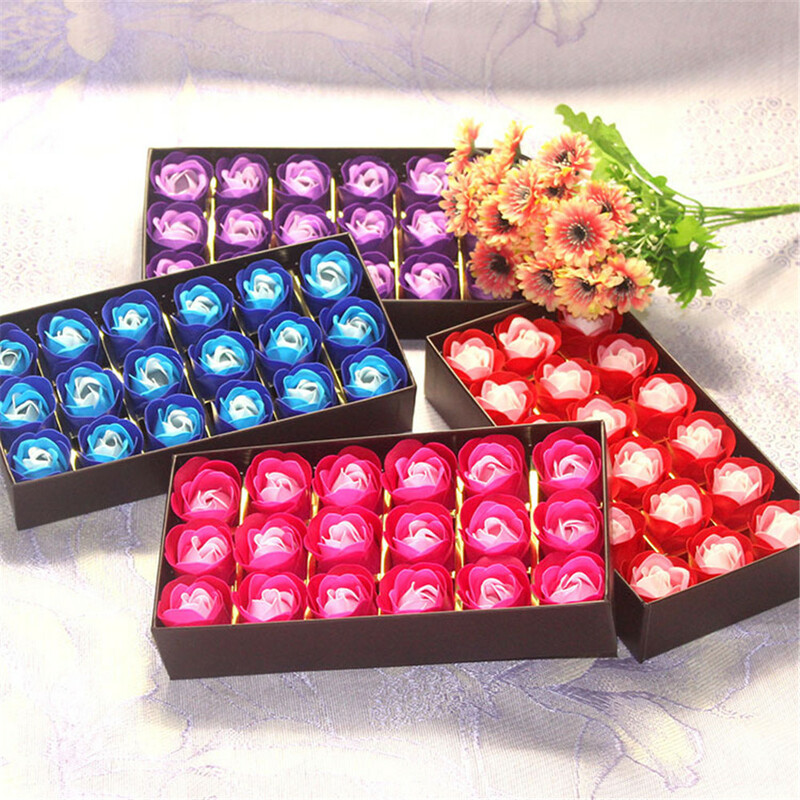 The treat boxes set from Gift Boutique respects that loved heart pattern many people go for to give shape to their feelings. If that’s what you have in mind for this year’s gift, this set might be just what you need. It includes 3 boxes of different sizes you can fill with cookies, cupcakes, candies, or anything you find appropriate. Each box features a White and Red Polka Dot Design with Red Cover and Clear Window, just perfect to capture the beauty of one’s feelings. If it’s a Valentine’s Day gift, red is a must. Reflect the feelings you nourish for your dear one with this Valentine’s Day Small Red Gift Box with Tissue Paper Filler from Hallmark Signature and your gift will surely trigger that smile you’re after. The box is 4.25 inches wide, 4.3 inches tall, and 4.1 inches deep, which makes it ideal for jewelry, gift cards, or small items. The unit includes a gift box, shredded tissue paper, and a matching ribbon. The high-quality materials used give it a luxury touch that stands for elegance. Just perfect to reflect the exquisiteness of your feelings! How do you make the best impression when offering a gift on Valentine’s Day? Things are simpler than you may think, but details are important. A lot of cool Valentine’s Day gifts may not have the intended effect if they are offered in the wrong box. So, do not forget this essential aspect: buy a gift box that says ‘I Love You’ just as much as what’s inside. Picking the right gift box may seem like a daunting task, but you should not get panicky about it. First of all, we are here to help you with some excellent ideas that will prevent any catastrophe. Your gift box can lend more personality to the usual chocolate box, or even a ring so that your present stands out. Your special someone deserves the best, and we know that you want to offer them the most beautiful experience on Valentine’s Day. It is in your power to make this day special and starting with the gift you want to offer, you can transform it into a memory both of you will cherish for years to come. We are only here to assist with making the right choices. We focused on a few important considerations when we opted for the coolest gift boxes on the market. We are now going to share this knowledge with you, so you can focus more on what gift you are going to offer your beloved. Even if the gift box serves a very limited purpose, which is to carry the present you want to offer, this does not mean that it should be made from cheap materials that look flimsy. They will make the wrong impression, and that is something you may not easily take back. A good point to start would be to read some of the Valentine’s Day boxes reviews available. They will give some idea on the gift boxes that are the most desirable for offering your present the right way. After all, this is how you are going to express your feelings, and if that falls flat on its face, you will feel bad about it, too. That is why the first piece of advice we want to offer you is to opt for a gift box that is sturdy and beautiful at the same time. Some shops are specializing in gifts that provide special wrapping services. Don’t get skimpy, and choose professional wrapping, if your gift is something that you know you will not easily deal with yourself. The gift box can be made from hard cardboard, and have a beautiful imprint, or can be covered with wrapping paper. Regardless of how it looks like in the end, don’t forget about these two aspects that will put you on the right path. Of course, you cannot just choose any gift box. It all depends on what you are going to offer. If you are thinking about an assortment of sweets, pick a large beautiful box with multiple compartments. It also serves to use wrapping paper that gives a hint or two about what the recipient will find inside. That will create a pleasant feeling of anticipation, and you will love seeing your loved one’s reaction. Also, you need to keep in mind whether your gift will work best in a large box or a small box. Items like jewelry are best to be presented in a small box, but, in case your beloved has a keen sense of humor, you can place your well-thought gift at the bottom of a large box. It all depends on your better half’s personality. Some gifts like chocolate boxes do not need extra packaging. But you can add a ribbon to make it look more festive. Use your imagination, or ask the salesperson at the store to add a little something for you, in case they offer such services. Don’t forget that this is an occasion to show your loved one how much you care about them. The best Valentine’s gifts are those that come from the heart. Even the most expensive jewelry will fail to express your feelings if you don’t give it enough thought to how you are going to package and present it. It is always a good idea to add a personal touch. For instance, you can add a card with a special message. Cards written by hand are a fantastic idea, but if you cannot trust your talents as a calligrapher, a good idea would be, again, to appeal to specialized services. Companies who offer customers the possibility to send gifts on Valentine’s Day often provide complimentary services, like wrapping and writing cards by hand. After all, if you are all for impressing your loved one, you surely wouldn’t mind spending a little extra. With so many items available for sale, we know that it can be hard to choose the perfect gift box right from the get go. What we need you to do is to think about what things both you and your loved one like best. It could be anything from a movie, like Star Wars, to a video game, or a passion you share. Try to incorporate this common passion into the way you are going to present your gift. The gift may be or may not be related to it, but still, the thought will be appreciated. The best Valentine’s Day boxes are those that will express your love. Down to the minutest details, you will create the perfect gift for your loved one. And the love that you will receive back will be the greatest reward. Depending on your beloved’s preferences, you will find the best options to consider for a gift box, so that your present is received with feelings of affection.